If this fairy-tale castle looks familiar to you, let us jog your memory. The fairy-tale architecture of the spectacular Neuschwanstein Castle proved the inspiration for Sleeping Beauty Castle in Disneyland and the logo of Disney Pictures as well as featuring prominently in movies such as 1968’s Chitty Chitty Bang Bang. Set in the Bavarian Alps, it was built in the 19th century for King Ludwig II, an eccentric and pedantic man who watched the construction of his dream castle closely. A huge fan of the composer Wagner; Ludwig called the castle Neuschwanstein (New Swan Stone Castle) a title taken from the Swan Knight, a character in one of Wagner’s operas. However, the lavish design did not win many fans at the time – Ludwig was labelled crazy and stripped of the throne in 1886, many of the castle’s rooms were still unfinished. Today, in excess of of 1.3 million people visit the castle per year. A relative newcomer to the list of prominent castles, the impressive 19th century Jacobethan-style walls of Highclere Castle are recognisible thanks to it appearing in a host of television shows and movies. However, most recently much of that recognition can be attributed to the runaway success of British television network ITV’s period drama Downton Abbey. 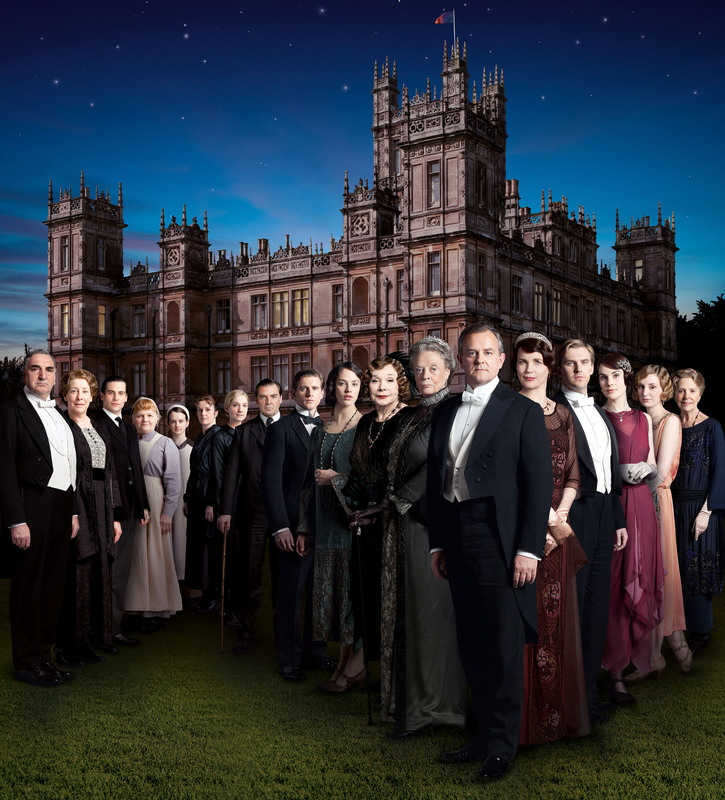 The Downton Abbey cast, including Dame Maggie Smith in a publicity still for season three. Courtesy ITV. The lives, loves and dramas of the aristocratic Crawley family and their servants are set within its walls and are watched by more than 11 million viewers in the UK and millions of other in more than 100 countries across the globe. Still the home of the Earl and Countess of Carnarvon the castle is open to the public and also claims a role in one of the most significant archeological discoveries of the 20th century and the largest haul of treasures ever discovered. It happened in 1922 when the 5th Earl, George Herbert along with his archaeological colleague Howard Carter, discovered the tomb of the Egyptian Pharaoh Tutankhamun. Before his untimely death (which some attribute to a curse) the earl established an Egyptian Exhibition in the castle which can still be visited today. If not from the fairy-tale mode, Portugal’s Palacio Nacional de Pena is surely the world’s most colorful castle. The walls and turrets of this Romanticist-style palace are vibrant shades of yellow and red. The palace dates back to 1840, when Ferdinand of Saxe Coburg-Gotha (the husband of Queen Maria II) commissioned a Prussian architect to design a royal residence on this dramatic site on a hill above the town of Sintra. A UNESCO World Heritage Site and named as one of the Seven Wonders of Portugal, this national monument is used for state occassions and is open to visitors, who can walk or take a carriage up to the palace from the park below. Again this castle may look familiar because it was used in a scene in Jackie Chan and Owen Wilson’s Shanghai Knights. Considered the most beautiful castle in the Czech Republic and a National Cultural Monument, this royal castle dates back to 13th century, but was constantly added to and remodelled until its present appearance in the English Windsor-style between 1841 and 1871. The castle’s association with royalty ended in World War II when, in 1940, it was seized from the last owner, Adolph Schwarzenberg, an outspoken opponent of the Nazi regime, by the Gestapo. He would never regain his property as it was confiscated by the government of Czechoslovakia after the war. A castle with connections to Shakespeare and known as Elsinore in the play Hamlet, it is one of the most important Renaissance castles in Northern Europe. Dating back to the 1420s it was built to protect the sound between modern Denmark and Sweden and the entrance to the Baltic Sea. Between 1574 and 1585 it was converted from medieval fortress into the spectular Renaissance castle by King Frederick II. Despite being destroyed by fire in 1629 it was completely restored under the reign of King Christian IV. The Swedes would take the castle and plunder much of its wealth in 1658 and a century later royalty left the castle and it was converted into an army barracks. In 1923 the army also left and after a thorough restoration it was opened to the public. It was added to UNESCO’s World Heritage Sites list in 2000. This entry was posted on Tuesday, October 16th, 2012 at 11:02 am and is filed under Countries, Destinations, Miscellaneous, Travel. You can follow any responses to this entry through the RSS 2.0 feed. You can leave a response, or trackback from your own site. Our pleasure, thanks for the feedback. Fantastic post, a great read! I absolutely love castles, so thanks for sharing these. Thanks for visiting my blog, too. Oh, how I do love castles. Warwick is one of my favorites.